Simply receive a unique Japanese-styled pouch with purchase of a With magazine! This gift with purchase pouch is unique in design and can be carried in many different ways based on your preference. It can be used as a clutch, sling-bag or even a cosmetic pouch to be placed in your bag. Why did they use this pouch as a gift with purchase? 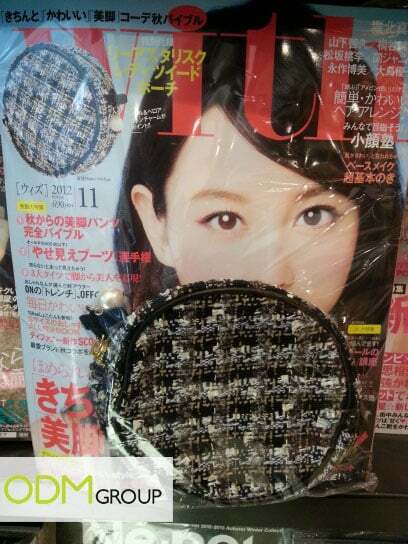 The Japanese-styled pouch is an attractive gift to entice customers to purchase the magazines. Similarly, the pouch is designed to accentuate the Japanese Fashion statement, which is in accordance to the Japanese-themed magazines published. With magazine as a reading guide to beauty, health and wellness, it targets ladies. It is important that organizations have gift with purchase that relates well to their target audience as well. To sum it up, this pouch is multi-purposeful, attractive and economical. Therefore, it is definitely a wise choice for any organization to have it as a gift with purchase. How may this gift with purchase affect sales? Pouches may seem as a common gift with purchase that it longer sparks interest from consumers. However, with good marketing and sufficient planning, positive results from the promotional may not seem that bleak. The Japanese-styled pouch will entice customers to purchase With magazine in order to redeem the gift with purchase. This not only increases sales for the magazines. In addition, With magazine may also brand the pouch by sewing their company logo on the pouch to increase brand awareness. This facilitates free advertising to anyone who sees this pouch. Their logo will also increase brand recall and act as reminder advertising for the user and viewers. It will enforce brand loyalty and encourage existing customers to make repeat purchases. At the end of the day, the perceived brand value is increased, alongside with the sales.